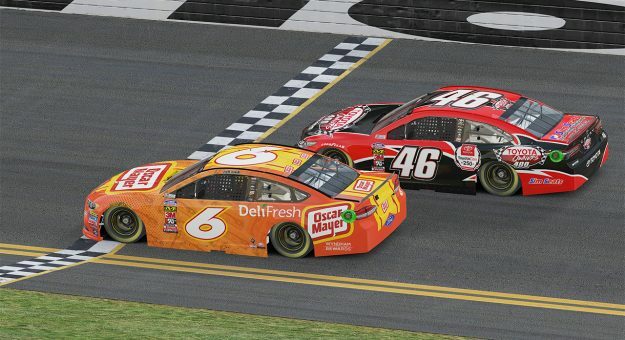 Zack Novak won the 2019 eNASCAR PEAK Antifreeze iRacing Series opener Tuesday night, narrowly holding off a charging Jimmy Mullis on a one-lap shootout at Daytona International Speedway. The Roush Fenway Racing driver scored a cool $1,000 for his victory and was helped by a great pit call as laps wound down. Mullis, who drives for Richmond Raceway Esports, ended up just .023 seconds behind after a late move off turn four coming to the finish. The two leaders hooked up on the restart, which was brought about after Jarl Teien pushed up into the turn four wall a few laps earlier, sparking a melee on the front stretch. With the pair in the clear, Mullis looked to the outside off turn four and, with help from Keegan Leahy (G2 Esports), began to surge up to Novak’s rear quarter panel. Unfortunately for Mullis, he simply ran out of racetrack. Leahy settled for third, a mere .100 seconds back. JTG Daugherty Racing’s drivers rounded out the top five after Nick Ottinger survived some late-race damage to come home fourth and Christian Challiner finishing fifth. Defending series champion Ray Alfalla looked strong as usual, but made a rare mistake leading to damage that took him out of contention. On Lap 54, shortly after his first green flag pit stop, Alfalla suddenly broke loose entering turn one. Despite his best efforts to save his car he tagged the outside wall, damaging the right side of his Wood Brothers Racing number 21 Ford. He would wind up nineteenth. Two other preseason favorites, Ryan Luza and Michael Conti, also had eventful races, but each came away with a top ten result. Luza of Flipsid3 Tactics, nearly had the lead on lap 94 with a push from Teien down the backstretch but could not quite clear Novak. He was then hung out on the last restart but held on for sixth. Conti worked his way forward from fourteenth on the grid to contend late but was caught up in the big crash and salvaged a seventh-place result for Jr Motorsports. Alfalla’s teammate at Wood Brothers Racing ,Chris Overland, started on pole and with passing looking to be difficult due to the high drafting speeds, appeared to be in prime position to control the race in the early stages. However, Teien, of G2 Esports, overtook Overland on lap seven, using a great push from Joe Gibbs Racing driver Bobby Zalenski. Two laps later, the first caution flew for Renegades Corey Vincent’s spin in turn three. Most of the field stayed out for track position and Teien continued to lead until lap 19 when Roush Fenway Racing driver Michael Guest and Luza hooked up and flew by Teien on the outside down the back straightaway. The lead changed again on Lap 30 when Luza took over the top spot. He would not relinquish the lead until pitting on Lap 42. Leahy emerged with the lead after the round of stops as the high speeds broke up the pack with only around 20 cars maintaining contact with the lead draft. Cars that wound up as the last in line were especially vulnerable to losing contact with those in front. The lead would change hands once more before the last round of pit stops, where Novak burst onto the scene. The team championship points after the first race is tight as well. JTG Daugherty leads the way with 73 points after a 4th and 5th place finishes by Ottinger and Challiner. JR Motorsports is close behind with 67 points earned from 7th and 8th finished from Conti and Brad Davies. Rounding out the top three in team points is Richmond Raceway Esports (66 points) as Mullis finished 2nd and Malik Ray finished 14th. The series shifts to the 1.5-mile confines of Las Vegas Motor Speedway for week two and will be interesting to see if different drivers find speed at the shorter track. 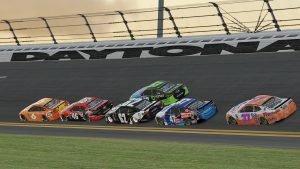 Novak will look to keep his early season momentum going while last year’s big three of Alfalla, Luza, and Conti look to break into victory lane. With the season off and running be sure to catch the action from Las Vegas on the iRacing eSports Network!